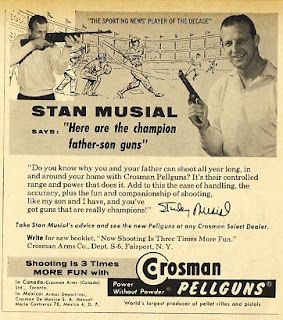 My son sent out a few 1958 Topps that he bought from Jim & Steve's at the Minneapolis Sports Collectible and Autograph Convention earlier this month. Last week he got a few back. 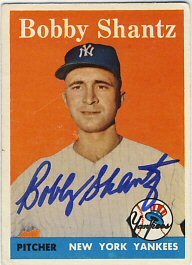 Bobby Shantz returned his card signed in one week. 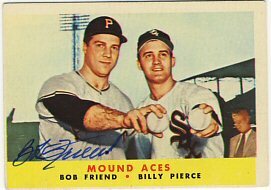 Bob Friend signed the Mound Aces card and returned it in 9 days. 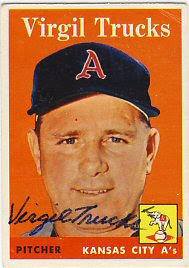 Virgil Trucks not only signed his card, but also included a signed card of his own, a signed stat sheet, and a nice note wishing John good luck in his baseball career. I was out of town for a few days this week and came home to some nice items waiting for me. 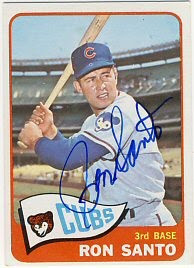 I sent in a ball and 1965 Topps to Jim and Steve's to be signed by Billy Williams, as well as a 1965 Topps for Ron Santo. All items came back in great shape. 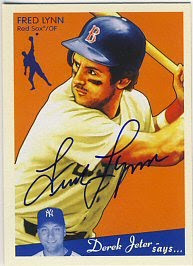 I also got back another 2008 Goudey, this time signed by Fred Lynn. I had sent this in to a paid signing being run by an SCN contact. My son also got back some items this week. I'll post those later. On Tuesday night, my son had an exciting visitor at his baseball practice. The Boston Red Sox were in town to open Target Field against the Twins and had a day off on Tuesday. 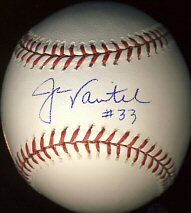 This gave Jason Varitek, a friend of Johnny's coach, time to attend their practice. 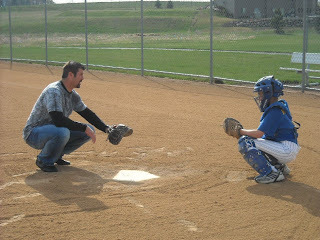 Johnny got some one-on-one coaching on catching technique. Jason also talked to the kids about working hard and doing well in school. I brought along some baseballs for him to sign (did you think I'd pass up the opportunity?). 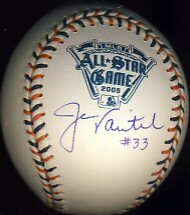 I brought enough for each of the kids and also had him sign some 2005 All Star balls for me and my sons. 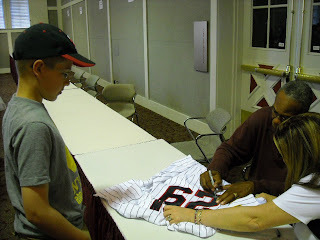 Yesterday my boys and I went to the Minnesota Sports Collectible and Autograph & Convention in Brooklyn Center. 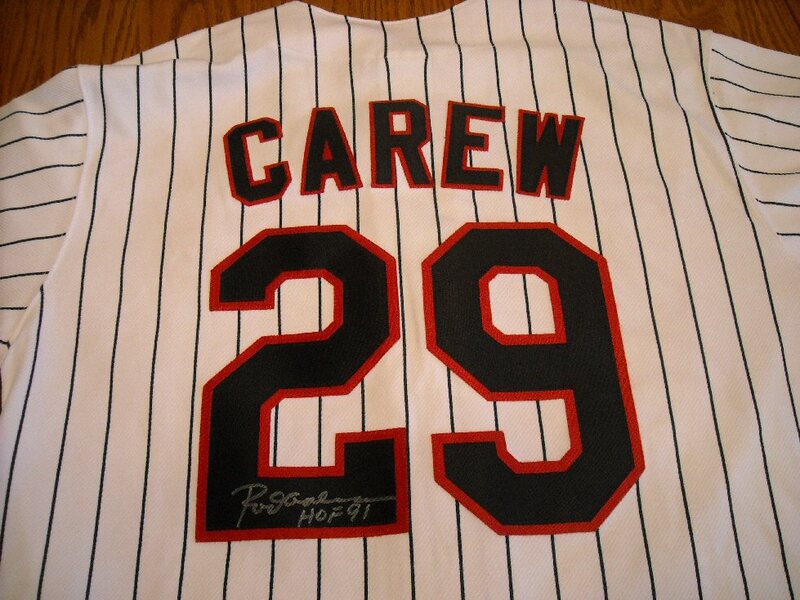 My older son and I were there to get Rod Carew to sign jerseys for us. My younger son wasn't there to get any autographs but was along for the ride. 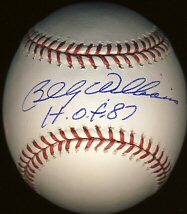 We went with a friend who got Johnny Bench and Pete Rose on baseballs. The event was much smaller than I thought it would be. There were plenty of dealers on hand, including Jim & Steve's. It was nice to meet Steve. My son bought $20 worth of 1959 Topps to send off for autographs from them. The event was very well run. Autograph tickets were numbered so you didn't have to wait in line all day. There didn't seem to be that many people there though, so I hope this doesn't mean there won't be another event like this in the future! If we hadn't spent so much on the jerseys and autograph fees for Carew, we would have gotten more autographs and maybe spent a little more at the card show. I've been looking through the lot of Sport Magazines I bought and found a few more interesting things. 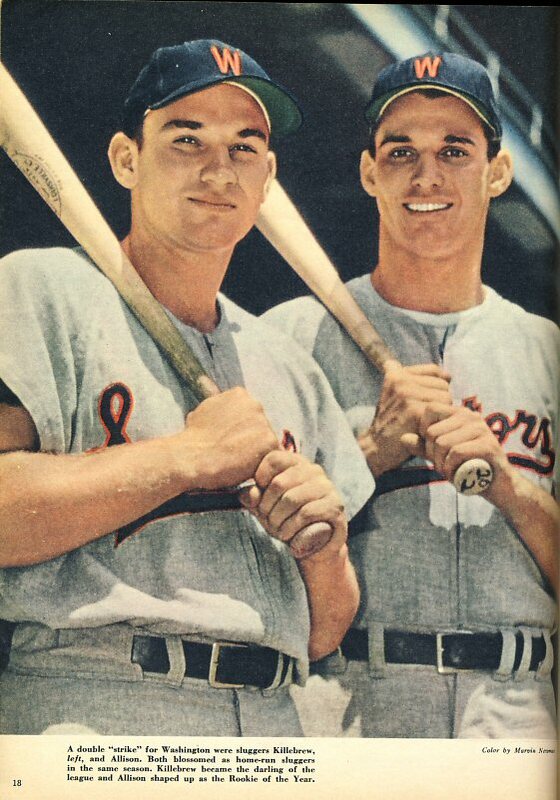 The November, 1959 issue has a great picture of Harmon Killebrew and Bob Allison. I'm no hunter, but this picture of Frank Malzone stepping into a canoe with his rifle makes me nervous. 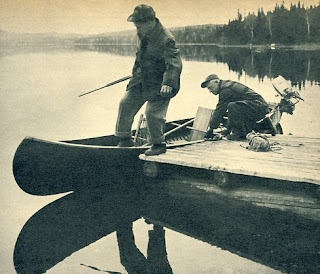 Couldn't he set it on the dock while he was getting in? 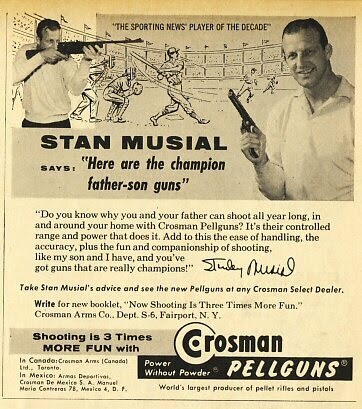 This comes from the March 1959 issue. In that same issue, an article on expanding the league points out the "new" Metropolitan Stadium as meeting all the needs of a major league club. 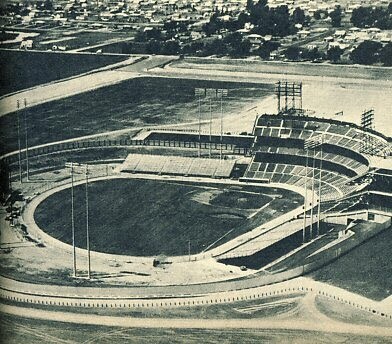 The Twins would play there two years later. Speaking of the Twins, they are on a streak, winning 4 in a row. 3 against the tough Angels and a rough one against the White Sox last night. J.J. Hardy is proving to be a good pick up for the team, but I think Hudson is a disappointment so far. I guess I'll give him a few more games before I decide for sure. 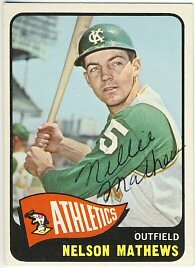 Today I got back two more 1965 Topps for my collection. 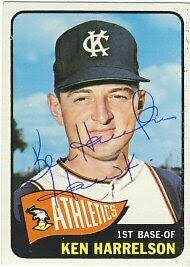 Ken "Hawk" Harrelson signed his 1965 Topps in ballpoint. And Nelson (Nellie) Mathews signed his in ballpoint as well. 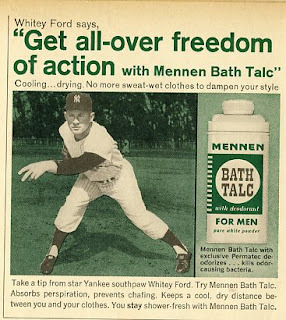 Baseball practices begin for my sons this week so I'll be very busy in the evenings. If possible, my collecting will be even slower now than it has been recently. Today is the opening game for the Twins, but unfortunately they're playing the Angels so the game doesn't start until 9:00 Central. I'll start watching, but doubt I'll make the whole game. Yesterday I received a group of Sport Magazines that I bought on eBay. 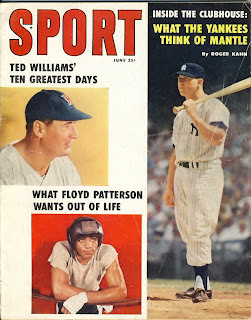 All eight magazines are from 1959 and many of them are focused on baseball. 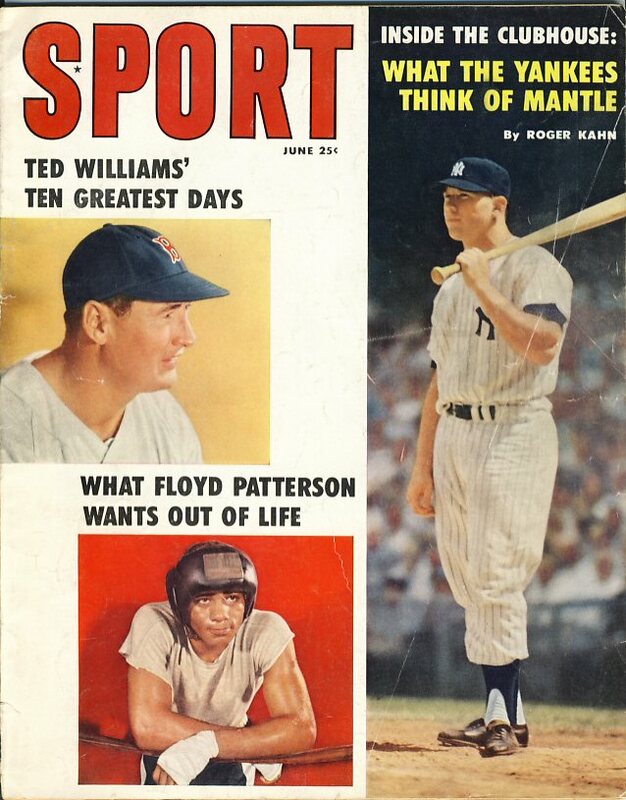 The June, 1959 issue has both Ted Williams and Mickey Mantle on the cover, as well as Floyd Patterson. It includes an article on Mantle by the famous Roger Kahn, and of course, great old advertisements. and great color pictures of Mantle and Snider inside. For $3.75 each, less than the cost of a new magazine, these are great entertainment and an inexpensive piece of sports history. 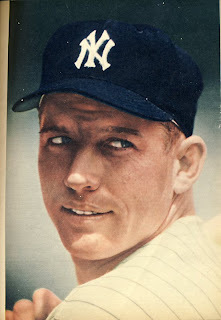 I am about 80% done with the Willie Mays autobiography, thanks to my recent business trip. I think next I'll read The Boys of Summer, by Roger Kahn. I think I've read it once, but that was probably 15-20 years ago (can I really be that old?). 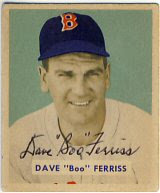 Today I received the 1949 Bowman Dave Ferriss card I sent out on 3/27. 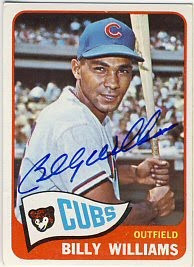 He signed it nicely in ballpoint which looks great on these vintage cards. This is the card I have been looking for and a reader of my blog was kind enough to pick it up at a card show and send it to me. Thanks again Art!